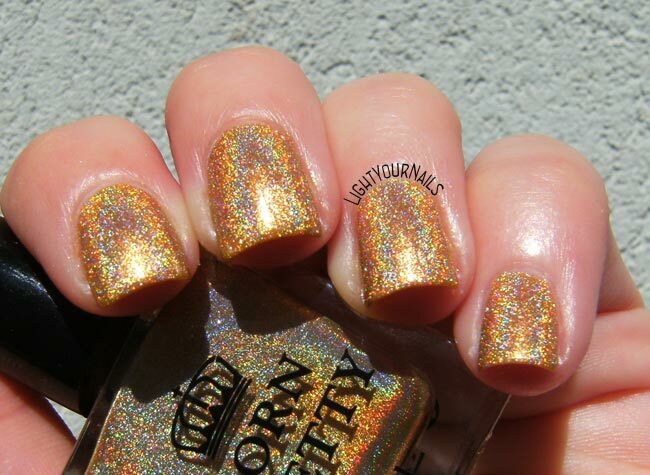 Bornpretty holographic H010 Heart of Gold | Light Your Nails! Today I am showing you one of the most recent holographic nail polishes by Bornprettystore. It’s ref. H010 Bornpretty Heart of Gold*. The nail polish comes in a cardboard box and the bottle has a double cap. You can remove the outer one when you apply nail polish so you can have a better grip. As you can guess from the name, this is a gold holographic nail polish. The holo flame is really hot. Application is easy and you need no special base coat. Coverage is pretty good as it’s a one-coater despite the light shade. Bornpretty’s holos never disapponted me. They apply easily and the holo effect is always very strong. The only downside is the price, which is not cheap. Fortunately shipping is free worldwise, unless you want a tracking number. What do you think of this golden nail polish? Do you own any Bornpretty holo, old or new? Thats super holo! I've been holding off buying them, but I think you finally sold me on trying their holos! Evviva! A me piacciono tanto i loro smalti da stamping! In the photos you see two coats but honestly, it looks the same as the first coat. I did a second one only because I had smudged a nail. Non ho mai provato holo chiari di BPS, devo dar loro una chance. Davvero? Io i primi 6 (?) penso di averli tutti. Obrigada! I have 3 of the new ones and almost all old ones and I really love them all! Holy holo, Batman! This is gorgeous! That's an amazing holo! I'm going to have to give BPS polishes a serious look at seeing this. I know there are a whole lot of indies out there but these Bornpretty holos are so pretty, too! Holy cow that's a gorgeous holo. WOW, what a strong holo effect. I loooove this one and I need it ASAP! This is a spectacular polish! Born Pretty Store has done a great job with their holos. Catrice ICONails 11 Go For Gold!